Their missions have intersected but, before this month, the presidents of the NAACP Legal Defense Fund and the International Association of Chiefs of Police, had never met. But on July 10 the leaders of the two groups sat together on a panel on Face the Nation, just days after the shooting deaths of Philando Castile and Alton Sterling at the hands of police officers. A week later they reconnected at the White House as President Barack Obama gathered law enforcement leaders and civil rights activists to discuss community policing. On Monday, Sherrilyn Ifill, of the Legal Defense Fund, and Terrence Cunningham, of the IACP, are bonded by $1 million donations that basketball legend and Charlotte Hornets owner Michael Jordan has made to each organization to help establish better trust between police and the communities they serve. The donations from Jordan should have a tremendous impact on both groups. The Institute for Community-Police Relations, a new division of the IACP, had a $600,000 budget before Jordan’s donation. (The overall organization has an annual operating budget of $25 million.) The Legal Defense Fund’s annual budget is $14 million. The NAACP Legal Defense fund was founded in 1940 by Thurgood Marshall, who in 1967 became the first African-American Supreme Court justice. The LDF under Marshall represented African-Americans as they attempted to get due process from the law despite state-sponsored inequality. 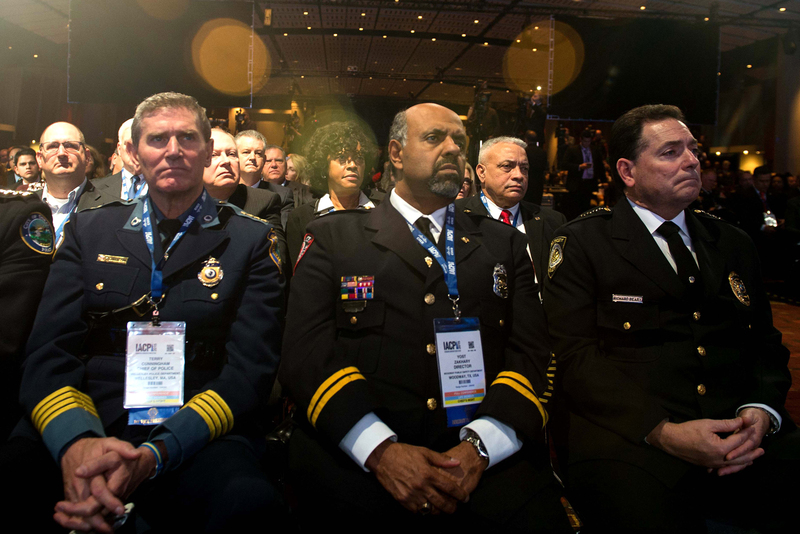 Law enforcement officers listen to US President Barack Obama speak at the International Association of Chiefs of Police Annual Conference and Exposition in Chicago on October 27, 2015. In its past, the LDF sued hundreds of school districts to eliminate segregation and allow for better educational opportunities for African-Americans. Currently, the LDF has sought changes in policing following the recent shooting deaths of African-American men in Baton Rouge, Louisiana, and St. Paul, Minnesota, and spoken against the attacks on officers in Texas and Louisiana. The other group receiving a $1 million donation, the IACP Institute for Community-Police Relations, was launched in May. Its mission is to advance a culture of cohesion and trust between police and the communities they serve. Among other things, it is developing educational materials to help agencies build and foster positive community-police relations, offering training for agencies and facilitating citizen-police dialogue.